Just Love Christmas: How to avoid a Christmas in July drama. How to avoid a Christmas in July drama. Sometimes, you should listen to your own advice. Last week in my article about 10 things to help plan Christmas in July, I should have listened to point 9. Planning. My advice was to not leave it until the last minute. Well, hmm guess what. Yep, we have left it to the last minute. Each year we have the party in someone's house, but this year we have booked a room for the event. But haven't, until this week discussed the food. Whoops. 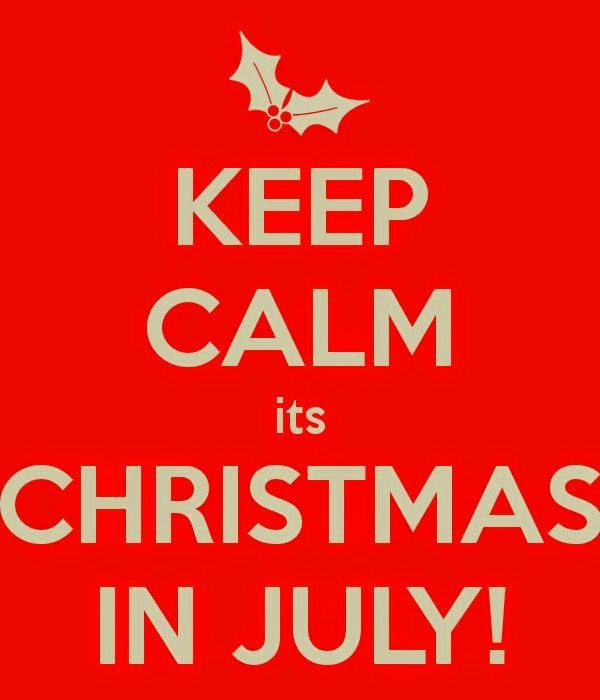 Thank goodness the planning for Christmas in July is but once a year. So here are my two Christmas in July dramas from this week. On Thursday, my wife was not to well, so I went to meet up with all the other wives to organise the Christmas in July party for next week, for over 50 people. That is correct, next week. Nothing like planning well in advance. As a male I took the direct route. Everyone chip into a kitty, then allocate out who does what. Nah, didn't quiet work out like that. We went around in circles. Firstly it was ah lets get in some caterers. Not a bad idea, but this soon to the party, and calling at 8 o'clock at night. Not sure that was ever going to work. At about this time one of the husbands, came in and suggested exactly the same as I had. A kitty. There was silence for a moment and then beautifully the women ignored the comment. And this is the part that made me chuckle. The caterers who were offering a Christmas lunch, included the turkey but instead of roast spuds, baked potatoes. Baked potatoes for a Christmas lunch, even in July, this was a stretch to far. At this stage it became apparant that Turkey, as flavourless as it is with roast potatoes, was a must have. So that was that. If we could not have roast potatoes with Turkey we would have to do it ourselves. So after a couple of calls, it was decided that caterers where not required. Wonderful indecision. I felt that one family should not shell out for the meat, hence the suggestion of the kitty. So instead the meat this time around was divided between four families but using smaller birds and one joint of beef. Tick that seemed to work. Then we just allocated out the rest of the food for the party. So after two hours, it just took us twenty minutes to allocate all the requirements for the party. Secondly. Ensure before the venue is booked, the food is organised that your wife is happy in what she will be wearing. Oh not a great place to be, if not. Not even H&M can come to the rescue on this one. I now have a whole week's drama ahead of me before the outfit is decided upon. Believe me, organising the food with a bunch of wives is a damn sight easier. Tip to be added to next years tips for Christmas in July will be, just book a restaurant and buy the wives outfit in the January sales.